Oak Brook Illinois is a village just a few miles down the road from West Suburban Funeral Home and Cremation which is mostly located in DuPage County with a small section in Cook County. As an adjacent suburb Chicago to Westmont, Oak Brook is the home to the headquarters of several sizable and well recognized brands and organizations including McDonald’s, Ace Hardware, Blistex, Federal Signal, CenterPoint Properties, Sanford L.P., TreeHouse Foods, and Lions Clubs International. It was originally known as Fullersburg, named after Ben Fuller, an early settler. In 1958, due to efforts of Paul Butler, Oak Brook Illinois was incorporated as a village. Prior to incorporation, the name Oak Brook was used by local residents to distinguish their community from neighboring Hinsdale and Elmhurst, going back to the founding of the Oak Brook Civic Association almost two decades earlier. The original boundaries of the village were smaller than present, but a large amount of land was annexed soon after the founding of the village, including the land that is now the site of the Oakbrook Center shopping mall. Oakbrook Center, a popular shopping center located due west of Chicago opened in 1962. The Oak Brook Illinois Sports Core, which features polo fields, a golf course, swimming and tennis facilities, and other recreational facilities contribute to the communinity and are not commonly found in a village of this size. Oak Brook is located at 41°50′24″N 87°57′11″W (41.84018, −87.953079). 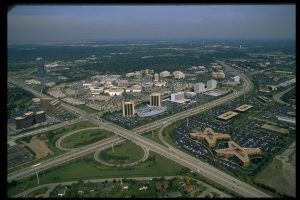 As of the 2010 census, Oakbrook has a total area of 8.279 square miles. It is located about 19 miles west of downtown Chicago and is served by a network of major federal, state, and county roads, including the Tri-State Tollway (Interstate 294), the Ronald Reagan Memorial Tollway (Interstate 88), and the Eisenhower Expressway (Interstate 290). Although Oak Brook is not directly served by any CTA or Metra trains, the commercial corridor along 22nd Street is served by several Pace bus routes, and train stations in neighboring villages offer commuter train access to downtown Chicago. The village’s adjacent neighbors are Elmhurst to the north, Hillside to the northeast, Westchester to the east, Hinsdale and Westmont to the south, Downers Grove to the southwest, and Lombard and Oakbrook Terrace to the northwest. For Funeral visitors traveling from Oak Brook Illinois, drivers should get on IL-83 South towards Ogden Avenue (US-34) and follow IL-83 S. Exit on Ogden (US-34) West to North Cass Ave in Westmont. Turn left or SOUTH onto North Cass Avenue and West Suburban Funeral Home and Cremetion Services will be located on the left.